Foster Program « Rescue K911 is an animal shelter located in Camp Hill, AL. Fostering can be an immensely rewarding experience for you, your family, your pets and life changing for the dog you foster. Just a few weeks in a home setting can sometimes be all it takes to help a scraggly stray become a loving pet ready to find a forever home! Foster care consists of providing a safe, loving, temporary home for a dog until a permanent adoptive home can be found. Many times our rescue is at maximum capacity and we need foster homes to save another life or to give more attention to some of our dogs that need extra care until adoption. Thank you so much for considering to be a foster parent. Foster home responsibilities & information. Foster parents must be at least 21 years old and have the extra time to commit to an additional dog in their household. They are expected to provide food, water, shelter, basic obedience and a safe, loving environment inside their home. Transportation to/from the rescue, offsite adoption events, or vet clinics may also be required. (vet fees paid by Rescue K911) We recognize that each fostered dog will have different needs so we will do our best to coordinate and tailor the fostering experience for each person and animal in our program. Be patient. Understand that these are rescued dogs and their behavior can be unpredictable. Be prepared for some adjustment in the beginning. It can be stressful for both you and the dog to be in a new situation. Most new rescues have come from situations where they haven’t received love and comfort. Now they’ve been given a second chance at life. You will be the key to assure this happens. Treat your foster dog like one of your own. Be willing to foster your dog from rescue to adoption. The amount of time needed to find a permanent home for a dog can vary from weeks to months. Rescue K911 is solely responsible for finding a home for the dog. The foster family must not place him/her in a home that has not been through Rescue K911’s adoption process. We do, however appreciate all help you can give us to find an appropriate home. Please have them contact us directly. The emotional aspects of fostering can sometimes be difficult and should be considered. It is easy to fall in love with any animal, especially one that has depended on you—and it can be hard to see them go to a new home. The wonderful part of fostering is knowing that you played a role in getting them there. If you find you might be interested in adopting your foster, you will then need to contact Rescue K911 and complete our normal adoption procedures and application as well. If you are working full time, provide a safe indoor place for the dog to be while you are gone. Rescue K911 highly recommends crate training to keep both the dog and your home safe and secure. Foster homes sign a Foster Agreement and agree to abide by Rescue K911 policies. Notify Rescue K911 contacts immediately in the event the dog is sick or lost (your foster agreement includes the names and numbers of your contacts). Take the dog to medical appointments as required. Notify your Rescue K911 contacts when you are going on vacation so we can provide another home for your dog to go to. Taking your foster dog with you also requires permission. 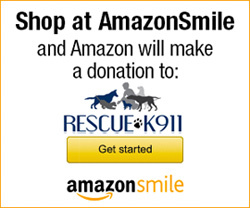 Keep Rescue K911 informed about your foster dog’s personality, quirks, behavior, etc. Your input is invaluable for describing the dog on the website and to potential adopters.